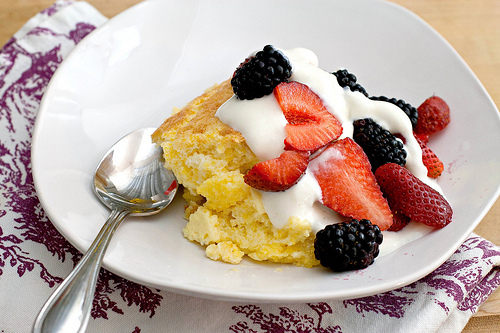 Spoon Bread with Honeyed Yogurt and Berries — Happy Fourth of July! Whew. Well we moved. And although we’re not yet totally unpacked (far from it), my kitchen is starting to look like a functional kitchen, and I’m beginning to have glimmers of interest in actually cooking again. It’s almost like a long illness — during the looong process of packing, moving and unpacking, I haven’t even wanted to THINK about cooking (thank goodness for my mother, who has been feeding us and delivering things like homemade meatloaf, or we would have been eating cereal and hot dogs and fish sticks for a solid month.) Even though I wasn’t cooking at all, I was hesitant to pack up my kitchen, in case I NEEDED something. The specialty bakeware and waffle iron went first, then the odd tools, followed by my beloved Le Creuset french ovens and cookie sheets. A few special items – my microplane grater, my Mexican style citrus juicer, my toaster oven — stayed unpacked until the bitter end. And the coffee maker came to the new house in the car and was the first thing plugged in. Naturally. Settling in carries its own tribulations — although I won’t miss our miniature dishwasher at the old apartment, the (not so new) dishwasher at our new place started belching and emitting alarming plumes of smoke the first time we tried to run it. We approached it with trepidation, looked closely, and it seems to be running OK now. I still have a box of pantry items I haven’t unpacked because there’s simply NO place for them to go, and as we’re missing a kitchen table, the fruit bowl is sitting awkwardly on the banquette. But we’re starting to have glimmers of functionality, and I’m actually considering making a trip to the farmer’s market this weekend, and actually cooking something. Cooking something real, and carefully crafted, and from scratch, to inaugurate the new kitchen (and no, toast and fish sticks do not count). And I’ll let you know when that happens. In the meantime, I happen to have this recipe up my sleeve that was cooked in the great Before, but I’ve been saving it for the Fourth of July, because it’s about as American as you can get. Spoon bread is a type of corn bread that so smooth and moist it must be eaten with a spoon. It was a dish that was popular at the time of the Revolutionary war, and is made with that all-American staple, cornmeal. 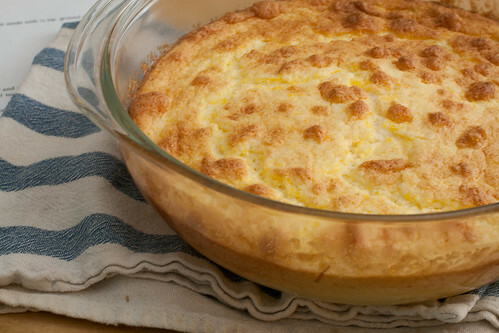 This spoon bread is a slightly modern version, lightened with beaten egg whites. Although most spoon breads you might encounter are savory, I like it as a satisfying, not-too-sweet dessert, served with some fresh berries and honeyed yogurt. 3 T honey, or to taste. Add the cornmeal gradually into the boiling water, stirring constantly so that lumps don't form. Let sit about 10 minutes until the mixture has thickened and the cornmeal has softened. Add the butter, salt, sugar and milk, and stir in the egg yolks. 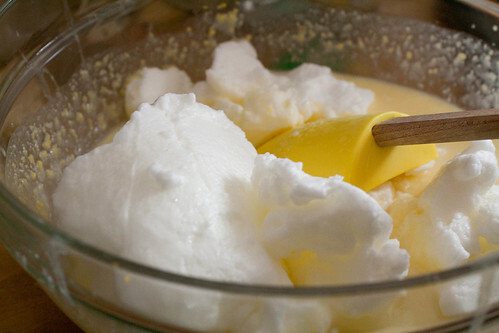 Beat the egg whites until stiff peaks form, and fold them into the pudding. Pour the batter into a 1 quart buttered baking dish and bake 30-40 minutes, or until puffed and brown. Serve immediately with honeyed yogurt and berries in bowls, with a spoon. Whip the yogurt and honey together until thoroughly combined. Congrats on the big move! It always takes me a few weeks to get used to the new kitchen – to remember where I put everything and adapt to the new flow. You’ll be turning out delicious things in no time. That looks SO good!! Mmm…I’m hungry! Good luck in your new home. The NYTimes has a new Opinionator series call Living Rooms. I think it would interest you. Congrats on the move! And this recipe is honestly one of the most tasteful 4th July recipes I have seen! Lovely! Enough of the neon coloured layer cakes!! Wishing you much happiness in your new home! Moving is so stressful! I am glad that you survived and are settling in. Congratulations on making it to the other side! After helping my parents move this month I feel your pain. I’m sure you are enjoying the beautiful new space and gorgeous layout. You’re back! I missed you. Can’t wait to hear more about what you make in your new kitchen. Congratulations on the move. I look forward to many beautiful plates and baked goods from your new kitchen. Wow this looks great. I love the beautiful picture! Perfect for 4th of July. That looks like a great light summer time dessert. Awesome recipe. I want this for BREAKFAST!